How do you know when you need stitches? Home / Blog / Cast and Bandage Protection / How do you know when you need stitches? Once you get stitches, you need to be careful to keep the wound clean.,A wound that keeps bleeding is a sign you might need stitches. It's always scary when you or a loved one has an accident and you immediately see a lot of blood. In an emergency situation, that fear may make it hard to properly assess the wound, especially with young children, who are likely more inclined to panic at the sight of blood. But when someone is cut, it's important to quickly figure out whether emergency attention is required. With a cut or puncture that is bleeding heavily, one of the most common treatments is stitches. Though minor cuts can heal on their own, deeper wounds require help to hold the skin together until the body can mend. But for many, the big question is: How do you know if you need stitches? When do you need stitches? Start by checking the wound. You might need to rinse the area off to properly see the depth and shape of the cut. Gaping open to an extent that the wound won't close with gentle pressure. Bleeding heavily with little or no signs of slowing. Located in a cosmetic area, such as the face, or on/near the genitalia. Located across or on one of your joints. Deep enough to expose yellow fatty tissue. The University of Pittsburgh Medical Center further reported that you may also need stitches if your cut is deeper than a quarter of an inch, exposing muscle or bone or still bleeding after applying pressure for 15 minutes. Regardless of its shape, depth or location, if the wound is the result of a bullet or other high-speed projectile, human or animal bite or a rusty object, you should seek medical attention. Even if these situations don't necessarily need stitches, your medical provider may advise a shot or other antibiotics. Knowing when you don't need stitches is also important. According to UPMC, if your wound is a puncture, shallow or has smooth edges that stay together even when you move, it will likely heal without additional assistance. If you're uncertain about the severity of your cut, it's best to err on the side of caution and seek professional medical attention. 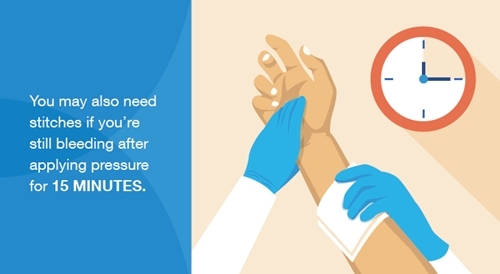 After you receive stitches, it's critical to keep the wound clean. Once you've determined that you need stitches – and have been treated – your next step is to ensure that the wound is properly cared for when you're back home. Your physician will probably give you detailed instructions on this topic, which will likely include a recommendation to keep the area dry, especially in the first days. While it's important to keep your stitches moisture-free, you don't need to give up showering altogether until your wound heals. Brownmed's SEAL-TIGHT® line offers a number of convenient products to help you live your normal life while you heal. For example, the disposable Shield patches provide a supplemental dressing that provides moisture protection while you shower. Just apply the patch to the wound site and then use the release tab to remove the patch when you're finished. You can find them at your local Walmart or online at Amazon.com today.